And now for something completely exhilarating: Bat Out of Hell on stage. The songs made famous by Meat Loaf a generation ago are the rock solid foundation of this production, which is a visually dazzling celebration of youth, passion and rebellion. The North American premiere of the show — Wednesday night at Toronto’s Mirvish Theatre — was a triumph for all concerned. This is the show composer Jim Steinman first began creating in college 40 years ago; advances in staging and the genius of director Jay Scheib finally put it on the stage. Director doesn't quite cover it: Scheib is more of a ringmaster. Bat Out Of Hell is a dazzling tale of star-crossed lovers, like Romeo and Juliet meets West Side Story, with some Peter Pan thrown in for good measure. Part drama, part love story, and part awesome spectacle, it’s hugely energetic entertainment, all of it brought to life by a cast adept at wrangling soaring rock compositions. Christina Bennington is Raven, the highly protected daughter of the dictator, Falco. The last thing Falco (Rob Fowler) would ever permit is any contact between his precious Raven and street kid Strat – of course, Raven and Strat fall in love. Their rebellious affair is contrasted against the frayed relationship between Falco and his wife Sloane (Sharon Sexton) – let’s just say all’s well that ends well, and acknowledge those four voices, plus Danielle Steers, Billy Lewis Jr. and too many others to list, as truly astonishing. The play explodes into action with All Revved Up With No Place To Go and moves through 20 songs of surprising power, including Two Out Of Three Ain’t Bad, Paradise By The Dashboard Light, Heaven Can Wait and For Crying Out Loud among them. And, of course, Bat Out of Hell. The frenetic action on stage — motorcycles revving, strobes, fiery explosions — often includes more than one story at the same time, thanks to the clever use of video; set designer Jon Bausor lists influences from Wagner and John Carpenter to Donald Trump for the complex carry-on that unfolds in a post-apocalyptic setting. 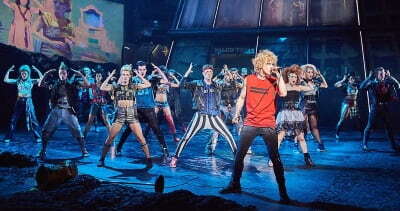 Bat Out Of Hell is a youthquake created out of music, dance and raw energy, but it’s really all about the songs — songs with the power to convey all the yearning and urgency of first love and heartbreak. Transporting to be sure, and unlike the rest of us, it never gets old.